The constellation of Cygnus is full of interesting nebulae of all kinds: dark, bright, reflection, emission. 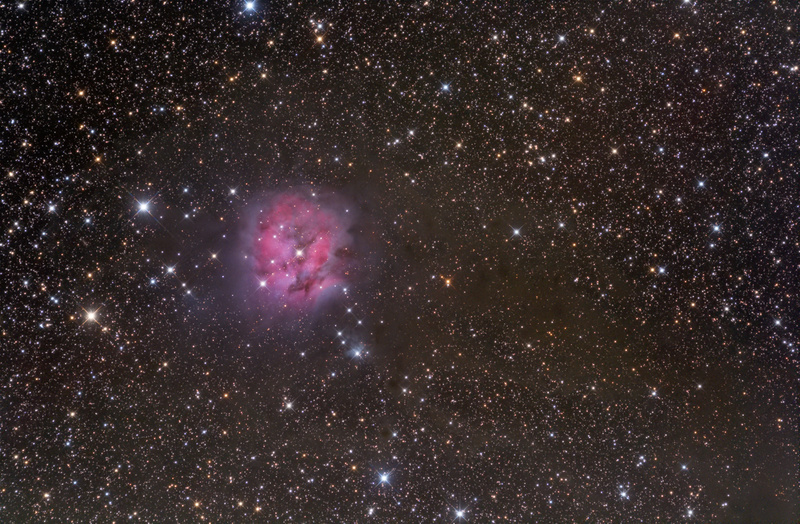 The Cocoon Nebula in the picture is one of them, featuring an open cluster of young stars, emission- reflection- and dark nebulae. With its complex structure one of the most spectacular objects in the night sky. At a distance of about 4000 light-years, the Cocoon's diameter is about 15 light-years, almost eight times of the size of the Solar System. Usually emission nebulae are associated with an open cluster of young stars that were formed of the nebula itself and are ionising the remaining gases making them glow. The case of IC 5146 is similar. Although there is an open cluster of young stars within the nebula, the ionisation is being done by a foreground star, which is member of another start cluster. There are three observations suggesting the cluster in the foreground was not formed of the nebula visible in the image: The distance of the stars in the cluster is a bit smaller than the distance of the nebula, the distribution of the stars in the cluster visible in front of the nebula is not aligned with the distribution of the gases in the nebula, and the difference between the mass of the cluster members and the mass of the nebula is too big. Based on these observations it is thought that the cluster was formed in another cloud in the foreground which was quickly eroded by the newly born stars especially by the strong radiation of BD +46°3474, the brightest star visible at the centre of the Cocoon. BD +46°3474 is a very hot young star of spectral class B0, its surface temperature is about 30000 to 35000 Kelvins (the surface temperature of our Sun is "only" 5700 K). Radiation and stellar wind of BD +46°3474 has reached the giant molecular cloud behind. Stellar wind is creating a cavity in the cloud while the radiation is ionising the gas in it. Through the cavity the inner parts of the molecular cloud and its cluster can be observed, creating a unique opportunity for astronomers. The cluster of IC 5146 is rather young, the average age of the stars in it is only 1 million years. Many of these stars are classified as Herbig-Haro objects, and many of the stars are T Tauri type variable stars. Herbig-Haro objects are young stars ejecting a narrow jets of gas which collide with the interstellar medium. A small reflection nebula identified as vdB 147 (in the catalogue of Sidney van den Bergh) is visible in the image slightly right and down to the Cocoon. It is a part of the large molecular cloud being illuminated by a nearby star BD +46°3471.